Until the end of May, Softube offers a special worldwide sale on its hardware/software mixer Console 1. Livid Instruments in currently offering Guitar Wing with over 50% off. Asparion has released the D400T DAW Controller and its D400F extension. 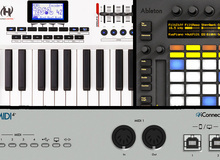 Livid Instruments has announced a permanent reduction in the prices of its MIDI controllers. Touché: make sure not to miss this video in which France's newcomers Expressive E demonstrate their debut MIDI controller. Arturia demonstrate their new KeyStep keyboard and sequencer.